This theme has a responsive layout that adapts from normal desktop screen to mobile devices (tablets and mobile phones). Responsive layout can be turned off easily if you don’t need it. Choose from 12 predefined colors, or use the color picker to create your own color. Several different layouts are available for showing your posts. Each layout is a page template, so you can use it for a normal page or set it as a homepage. Show posts in standard list view with small thumbnails on the left. Show posts in grid with equal heights, up to 4 columns. Show posts with masonry layout (grid with dynamic heights), up to 4 columns. Show posts grouped by category (1 category in 1 grid), 1 column or 2 columns format. Use drag & drop category manager from admin to manage which categories to show. Show posts grouped by category with masonry layout. Use drag & drop category manager from admin to manage which categories to show. 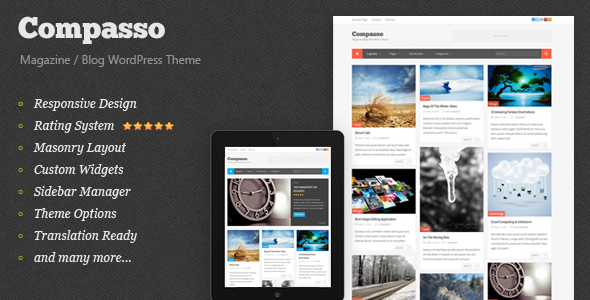 Theme Options page is included to allow you to customize the theme quickly and easily. It uses settings API with native WordPress styles so you will quickly familiar with the user interface. Ratings can be enabled on each post. You can add multiple ratings with custom criteria, and overall rating will be calculated automatically. Add as many sidebars as you want, and choose different sidebar on each page. You can also set sidebar position on each page (right sidebar, left sidebar or no sidebar). This theme has a built-in Search Engine Optimization settings. You can set meta description and meta keywords for homepage or any page/post, and specify which pages that are not indexed by search engines. SEO settings can be turned off if not needed, or if you already use a 3rd party SEO plugins. Please note, images used in preview are not included in the theme. You can find some images used here on PhotoDune.